Learning is facilitated in our comfortable, home-like setting which is attentively filled with developmentally appropriate materials that contribute to the growth of self-motivated, independent children. Each class contains a range of ages and abilities; more experienced children share what they have learned with younger children, who in turn enjoy the daily stimulation of older role models. These peer teachers help others by reinforcing their own skills and experiences by the responsibilities of leadership. Children care for each other in a warm atmosphere of acceptance and joy; adults consciously and delicately nurture the development through their caring and compassionate characters. Each class operates on the principle of “freedom within limits.” Children are free to work at their own pace, alone or with others. We encourage a balance of active, self-directed learning with small group collaboration and peer teaching, so that children will problem-solve, see natural connections in knowledge, and create new ideas. Children in this environment learn to make decisions at an early age, to reason, cooperate, negotiate, reflect, and understand. Through direct experience and the process of discovery and investigation, children learn most effectively – and attitudes toward learning remain positive and enthusiastic, not overwhelming. Maria Montessori, M.D., the founder and developer of what is called “The Montessori Method of Education,” based this new education on her scientific observations of young children’s behavior. As the first woman physician to graduate from the University of Rome, Dr. Montessori became involved with education as a doctor treating children. Then in 1907, she was invited to open a childcare center for the children of desperately poor families in the San Lorenzo slums of Rome. She called it “a children’s house,” and based the program on her observations that young children learn best in a home-like setting filled with developmentally appropriate materials that provide experiences contributing to the growth of self-motivated, independent learners. Dr. Montessori carried her training throughout the world, including the United States, as early as 1912. Children are to be distinctly respected as individuals that differ from one another. The basic premise in the Montessori philosophy of education is that all children carry within themselves the person they will become. In order to develop physical, intellectual, and spiritual potential to the fullest, the child must have freedom: a freedom to be achieved through order and self-discipline. The world of the child is full of sights and sounds that at first appear chaotic. From this chaos, children must gradually create order, learn to distinguish among the impressions that assail their senses and slowly, but surely, gain mastery of themselves and their environment. Dr. Montessori developed what she called the “prepared environment,” which possesses a certain order and allows children to learn at their own development, in a non-competitive atmosphere. The years between birth and six are the crucial years in which children learn the rules of human behavior most easily. These years can be constructively devoted to teaching the child good manners and habits, so that they may take their place in society. Patterns of concentration, established in early childhood, produce a confident, competent learner in later years. The Montessori teaching method teaches children to observe, think, and judge. It introduces children to the joy of learning at an early age and provides a framework in which intellectual and social disciplines go hand-in-hand. 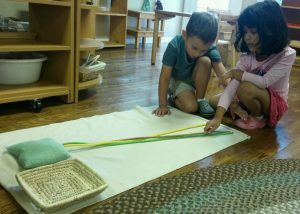 Each Montessori class operates on the principle of responsible freedom within limits. Every program has its set of ground rules which differs from age to age, but is always based on the core Montessori philosophy: respect for one another and for the environment. Children are free to work at their own pace with materials they have chosen, either alone or with others. The teacher relies on his or her observation of the children to determine which new activities and materials he or she may introduce to an individual child or to a small or large group. The aim is to encourage active, self-directed learning and to strike a balance of individual and small group collaboration within the whole group community. The three-year age span in each class provides a family-like grouping where learning can take place naturally. More experienced children share what they have learned while reinforcing their own learning. 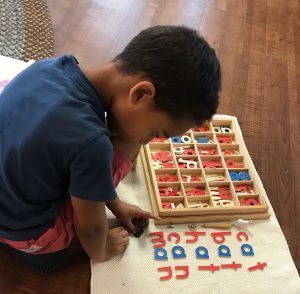 Because this peer group learning is intrinsic to Montessori, there is often more conversation, and more language experiences, in the Montessori classroom then in a traditional early education setting. The activities of Practical Life instill care for oneself, for others and for the environment. Through these tasks and experiences, children learn to coordinate their movements and develop fine motor skills. Practical Life activities are the foundation of all academic work because they promote concentration, order, independence, and a complete work cycle. The Sensorial materials are designed to enable the 3 to 6-year-old child to identify and refine information obtained through the senses. By seeing, smelling, tasting, listening to, touching, and further exploring the sensorial properties of these materials, children begin to classify and eventually name impressions in their environment. The Primary classroom is rich in language opportunities – listening to stories, singing, and conversing with others. The sandpaper letters connect each spoken sound with its symbol, supporting the development of writing, and eventually reading. 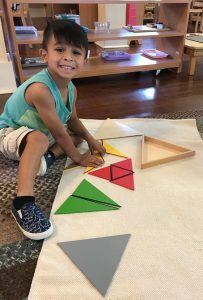 The math materials help children to develop an understanding of math concepts through the manipulation of concrete materials, building a secure foundation of math principles and skills. Science, geography, history, art, music and Bible are also integrated into the Primary environment. The elementary classroom is also a multi-age setting, with the class consisting of children ages 6 to 9. Mixed-age grouping encourages the sense of family and community, while providing mentoring opportunities in which the older students help the younger, thereby reinforcing their own skills. Freedom of movement, open work spaces, and uninterrupted blocks of time for individual and group projects all help to support the students to gain control over a growing body, as well as the child’s drive toward autonomy. Montessori elementary studies are based on a cultural curriculum, which integrates history, geography, math, science, biology, language, literature, art, music, and Bible studies. This interdisciplinary approach helps children build creative and critical thinking skills. The assignments, projects, and field trips include individual work, small and large group, cooperative work, and decision-making and evaluation. 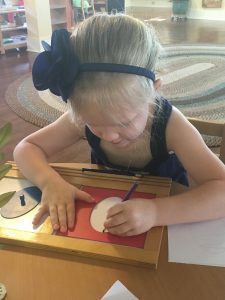 In keeping with the Montessori educational philosophy, the assessment of a child’s performance is based on a systematic collection of information that includes observations, portfolios containing examples of work, and conferences. What Happens When A Student Leaves Montessori? Montessori children are unusually adaptable. They have learned to work independently and in groups. Because they’ve been urged to make decisions from an early age, these children are problem-solvers who can make choices and manage their time well. They have also been encouraged to exchange ideas and to discuss their work freely, utilizing good communication skills while easing their way into a new setting. A significant predictor of future success is a strong sense of self-esteem, and Montessori programs, based on self-directed, non-competitive activities, help children develop a positive self-image and the confidence to face challenges and change with optimism.